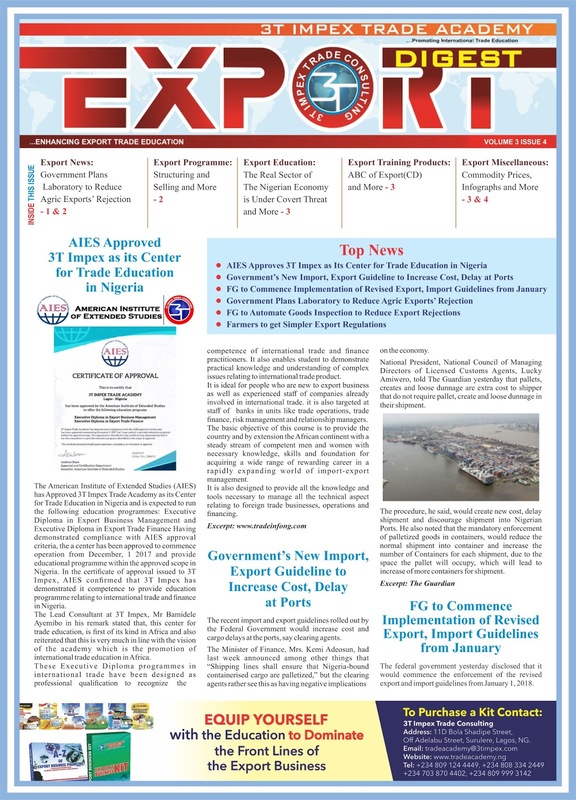 In This Week's Edition of Export Digest Newsletter - AIES Approved 3T Impex as its Center for Trade Education in Nigeria. The West Africa sub-region is a huge market with huge potential for growth if it is well harnessed by the member states. The countries within the region came together in 1975 to form the union called The Economic Community of West African States (ECOWAS), a trading bloc with a single market which comprises of 15 countries which include Nigeria, Benin, Togo, Ghana, Liberia, Gambia, Niger, Burkina Faso, Cape Verde, Cote Devoir, Guinea, Guinea Bissau, Mali, Senegal, Sierra Leone. The ECOWAS market remains an untapped potential that could lead to significant growth in non-oil export from Nigeria. 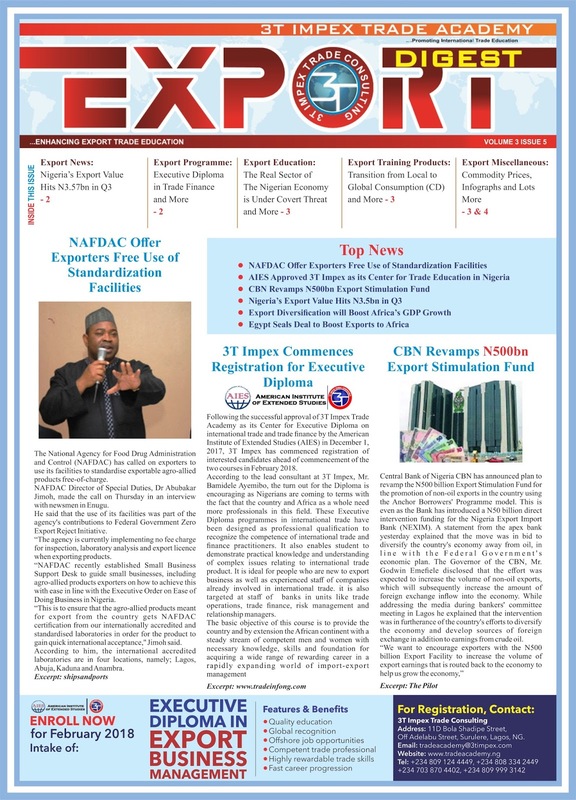 With a population of about 350 million people and GDP of about $1.48trillion, this market remains the low hanging fruits to be fully explored in the quest for the growth of the non-oil export volume from Nigeria. The data obtained from the National Bureau of Statistics showed that the volume of export from Nigeria to West African countries has been on the decrease. In 2013 Nigeria goods worth N756.9 billion were exported to different countries in the region. This increased slightly to N824.7 billion in 2014 and it has consistently being on the decline since then with an export volume of N599.8 billion in 2015 and N576.6 billion in 2016. 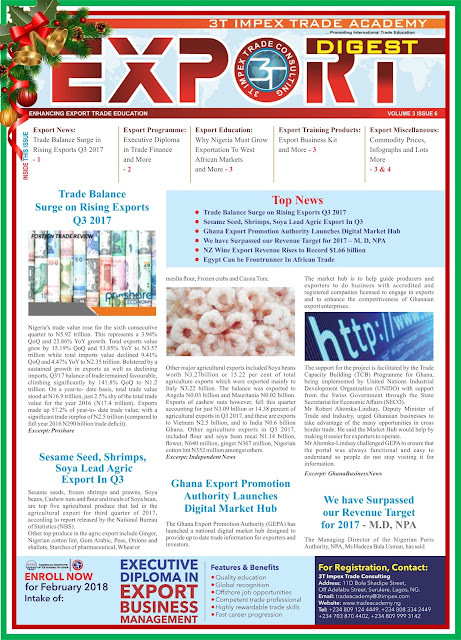 The potential of export from Nigeria into the ECOWAS region can be seen in the items of import into the region from Asia, America and Europe. The top ten products being imported into the region from different parts of the world include Fuels which represent 24% of total imports. They are followed by motor vehicles, tractors, cycles and other vehicles (2nd place), machinery , mechanical appliances and boilers (3rd), machinery and electrical appliances (4th), cereals (5th), plastics (6th), works in iron, iron and steel (7th), iron, cast iron, steel (8th), pharmaceuticals (9th) and fish and seafood (10th). The ECOWAS also presents a great potential for Non-Oil Export growth to Nigeria particularly in Agricultural products because of the similar lifestyle and culture of the people in the region and hence, the propensity to feed on the same types of food items. This means both raw and processed Agricultural products from Nigeria have a great chance of success in the ECOWAS markets. In addition to this, the doors to the other African markets will largely remain close until Nigeria conquer the West African markets. This is because, whatever strategy is deployed to penetrate ECOWAS market is the same with what needs to be done in order to penetrate other African market. Therefore, until such strategy that works in the West African markets is put in place, we will not have a model to replicate in other African countries. The products to be targeted in any strategic plan being developed to grow export into the West African markets should be based on internal exports and external exports. 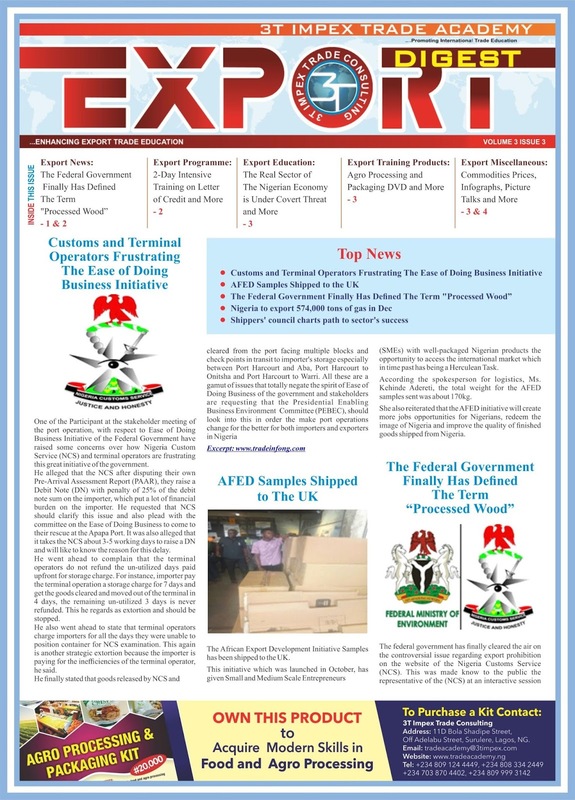 Internal exports are the items currently been shipped (both formally and informally) by Nigerians into the region and these include Detergents, Pharmaceutical, Slippers, Cosmetics, Plastic products, Biscuits. Cigarettes, Malts, Fruits Juice, Antiseptics, Toothpaste, CO2 Gas, Confectionery, Dairy products, Bar Soap, Paints, Corrugated Roofing Sheet, Glass Louvres, Cements, Furniture, Noodles, Cooking Gas, Lubes products, Maggi Seasoning, Salts, Liquid Soaps, Chin-Chin, Diapers, Shopping Bags, Insecticides and Carpet. The External exports are the products being shipped into the region by countries outside the ECOWAS (like the rest of Africa and other continents of the world). Out of these products, the ones that Nigerians can easily produce and ship into ECOWAS include: Agricultural products like Cereals, Snacks, Plastic products, Pharmaceutical products, Fish and Sea foods. The points highlighted above showed that the path of least resistance (with low hanging fruits to explore) to growing our non-oil export trade as a nation is to begin massive exportation of Nigerian products to the ECOWAS member state. This is because the transit time is shorter and hence shorter trade cycle. Also, the culture and types of goods are similar and so we can export our foods to them. In addition to this, they are less developed than us therefore, their standards are not too high for us to meet like that of the developed world. Lastly, the ECOWAS Trade Liberalisation Scheme (ETLS) makes it easier for them to buy products from us than from a third party because of zero duty payment for Importers that import from member states. In conclusion, it is very important to note that conquering West African markets will mean conquering the other export markets in the African continent. Therefore, any strategy that is developed and deployed now that works and thus leading to tremendous growth in our exportation to West Africa, is the same strategy (or probably with a slight modification) that we will need to grow the export of Nigerian products to the rest of Africa. The American Institute of Extended Studies (AIES) has Approved 3T Impex Trade Academy as its Center for Trade Education in Nigeria and is expected to run the following education programmes: Executive Diploma in Export Business Management and Executive Diploma in Export Trade Finance. Having demonstrated compliance with AIES approval criteria, the a center has been approved to commence operation from December, 1 2017 and provide educational programme within the approved scope in Nigeria. In the certificate of approval issued to 3T Impex, AIES confirmed that 3T Impex has demonstrated it competence to provide education programme relating to international trade and finance in Nigeria. 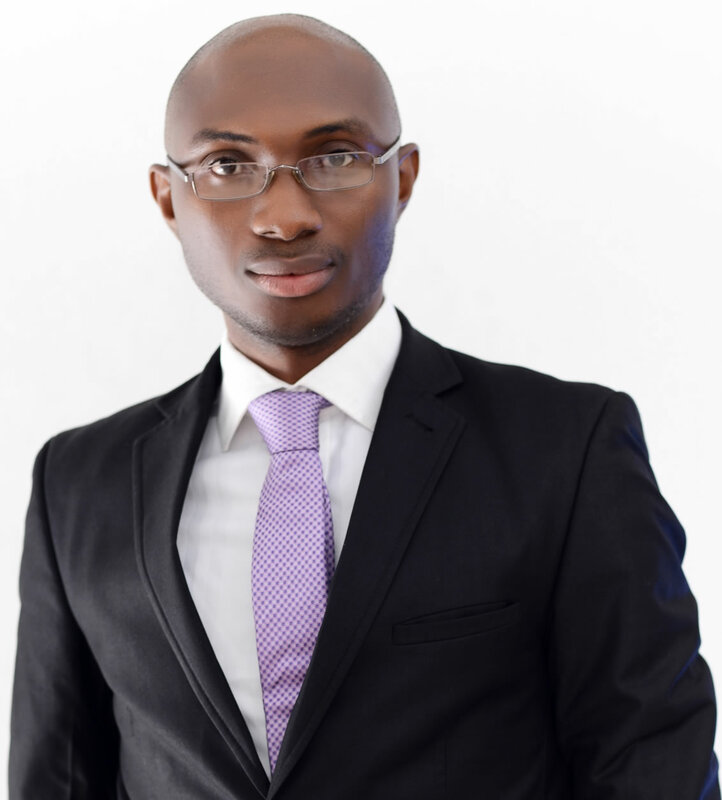 The Lead Consultant at 3T Impex, Mr Bamidele Ayemibo in his remark stated that, this center for trade education, is first of its kind in Africa and also reiterated that this is very much in line with the vision of the academy which is the promotion of international trade education in Africa. 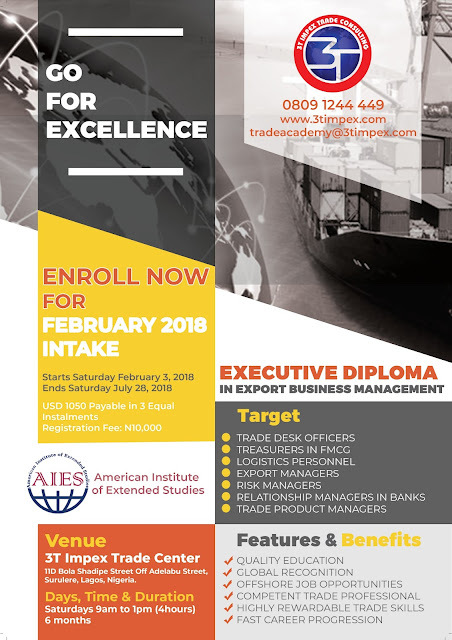 These Executive Diploma programmes in international trade have been designed as professional qualification to recognize the competence of international trade and finance practitioners. It also enables student to demonstrate practical knowledge and understanding of complex issues relating to international trade product. It is ideal for people who are new to export business as well as experienced staff of companies already involved in international trade. it is also targeted at staff of banks in units like trade operations, trade finance, risk management and relationship managers. 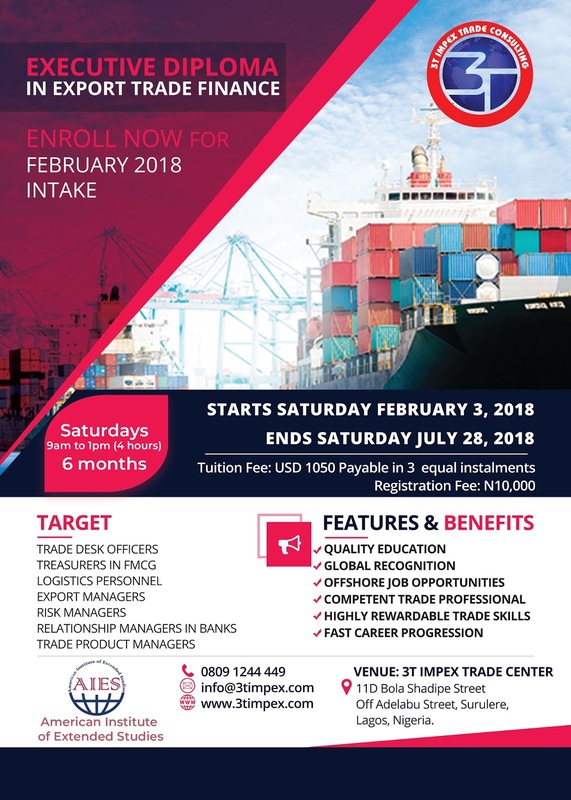 The basic objective of this course is to provide the country and by extension the African continent with a steady stream of competent men and women with necessary knowledge, skills and foundation for acquiring a wide range of rewarding career in a rapidly expanding world of import-export management. It is also designed to provide all the knowledge and tools necessary to manage all the technical aspect relating to foreign trade businesses, operations and financing.